Just as we are trying to scramble for answers on what to do with the pharmaceutical contamination of our water, news breaks out that illuminates as to one of the reasons why we got into the contamination mess in the first place; the systemic pharmaceutical overdose of our mass culture, fed by the multi billion dollar pharmaceutical marketing industry. John Lechleiter, a top company exec at pharma giant Eli Lilly (who is set to take the number one spot as CEO on April 1) has been caught in a very high profile "foot in mouth" crises. Apparently the exec issued an email in 2003 that made a specific reference to the use of Zyprexa by children and teenagers, although it is only approved for adults with Schizophrenia or bipolar disorder. Lechner wrote in his email that there is an "opportunity to expand the company's work with Zyprexa, olanzapine." Eli Lilly asserts that the email referred directly to clinical development already underway and not promotional activity. The information broke in a trial against Eli Lilly (State of Alaska v. Ely Lilly) involving marketing and side effects of the drug, including higher risk of diabetes, weight gain and heart problems. Simultaneously, the state of Connecticut has filed suit accusing the drug maker of promoting the Zyprexa for anxiety, depression and attention deficit disorder in children despite it not receiving FDA approval for those uses. It faces similar accusations in the case in Alaska. This all raises on question-why are pharmaceutical companies allowed to market to consumer at all? Turn on a television on any given day and you will find a million dollar ad for depression. But how is a consumer to determine if they have the described mood disorder that requires medicating, or perhaps, one of many underlying possible physiological conditions that show symptoms of depression (e.g. diabetes, menopause, low tetosterone levels etc.)? We require doctors to attend a dozen years of education to be able to diagnose and treat our ailments, yet television commercials make us believe that in thirty seconds we might diagnose why we feel the way we do - and even offer a treatment plan. This type of approach preys on the publics ignorance and thirst for quick fixes, and does little to actually educate a consumer on health. In the case of psychiatric conditions, there are no real quantitative tests and the medical profession relies on a patients perception of their symptoms and condition. Drugs get prescribed often based on what a patient asks for rather than what a doctor suggests, often swayed by what the patient is led to believe they have based on a million dollar ad spot. Why are we not advertising other treatments (equally as invasive as altering your physiology with heavy doses of chemicals), say surgery. How about a 30 second spot on the benefits of a triple bypass, or a gallbladder removal? Or a paid for TV infomercial on the joys of hysterectomies. According to a 2004 report by University of Washington $25 Billion per year is spent on promoting new drugs and distributing free samples to doctors. Direct to physician activities accounted for a bulk of the spending with a $5.3 billion spent on "detailing," a practice marketing to physicians, by live visits, by pharmaceutical sales representatives in order to promote their firms drugs. Free drug samples during such visit were valued at $16.4 billion. Who is picking up these astronomical costs you might wonder? "As the cost of prescription drugs continues to escalate, increased attention is being focused on the role of pharmaceutical marketing practices as a cause of higher drug prices," said Robert Jacobson, professor of marketing at the University of Washington Business School and co-author of the paper. 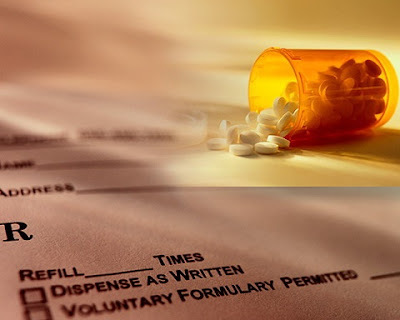 The report when on to cite a study where researchers analyzed data for three widely prescribed drugs issued by some 74,000 physicians over a two-year period to investigate the effect of pharmaceutical sales representatives on physician prescribing behavior. For each of the drugs in the study, Jacobson and Natalie Mizik, assistant professor of marketing at Columbia University, assessed the effects of changes in the numbers of sales calls and free samples on the number of new prescriptions the physician issued. The results indicated that it would take approximately 3 additional visits by a pharmaceutical sales representative to induce one new prescription. It would take 26 additional free samples to induce one new prescription. In short, the study points to a clear example of the pharma industries deliberate intention to not only sway the public, but the medical profession in to "pushing" certain medications. There is a significant problem in marketing products to consumers for conditions they are not qualified to diagnose. Symptoms can look and feel the same across many illness, and it is for an unbiased medical professional to ascertain the possible causes of the symptoms. The problem is, how unbiased has our medical community actually become? Drugs have become benign in our culture - we pop pills like expensive designer tic-tacs. We don't seem to be getting so much healthier as a population than playing musical chairs with our condition - trading impotence for heart disease, or depression for diabetes. We overlook the small print, because there is an overwhelming amount of it written in medical language most people do not understand while the benefits are touted in catchy colorful ads. There needs to be an overhaul of the entire process of how pharmaceutical companies are allowed to interface with the public in general. Educational interface is different than a sales opportunity. We don't sell guns on TV because of potential dangers, yet we sell smoking guns in pill forms that have shown (in millions of consumers) severe adverse reaction and even death. Marketing to the medical profession needs to be tightly regulated, where doctors are not offered free lunches by pharma reps to carry the new drug of choice. And doctors shouldn't be given free samples of drugs, promoting easy distribution to patients. There needs to be a difference between how buyers at department stores are treated by manufacturers, and how doctors are treated by the pharmaceutical industry. We need to ask ourselves - when did our health become bankable...and why are we letting it happen?